The Centennial Monument, located in Central Park, commemorates the 100th anniversary of the incorporation of New York Mills and the historical significance of the geographical setting of New York Mills, MN. 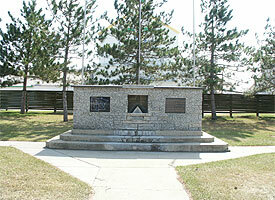 The monument, which is situated precisely on the Continental Divide, is flanked by the five flags which have flown over the area. These are the flags of England, France and Spain, the current American flag and the American flag of expansion with its 15 stars. The plaque goes on to explain that the west-side of New York Mills was within “Rupert’s Land” granted by King Charles II in 1672 by “Governours and Adventurers Trading in Hudsons Baye.” In 1818 the land drained by the Red River, which lies south of the 49th parallel was released by the United Kingdom. 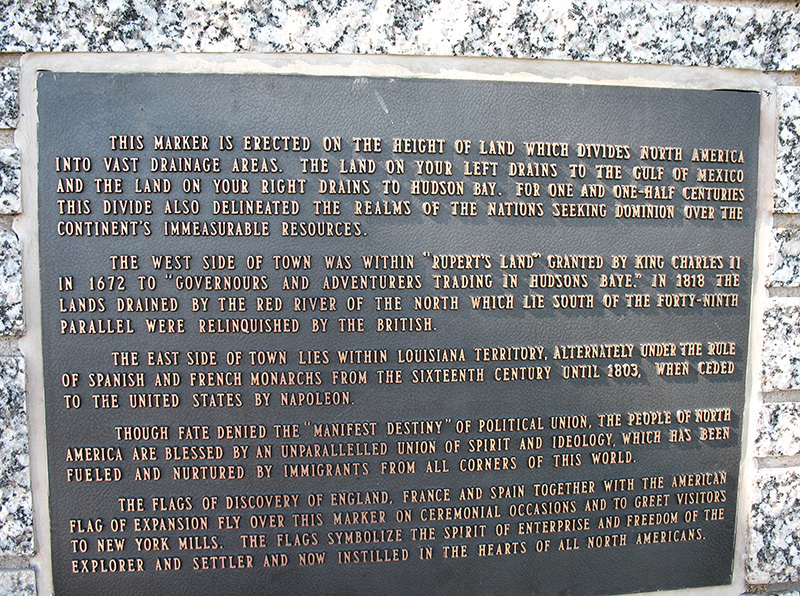 The east-side of New York Mills was within the Louisiana Territory, which was under the rule of Spain and France at alternating times from the 16th century until 1803, when ceded to the United States by Napoleon.